We started thinking we would feed a few birds outside the kitchen window. Then we learn more about birds, and that each type of bird has a preferred food. So we add a few different types of seeds. One of the pleasant surprises has been the nocturnal animals at the bird feeder. 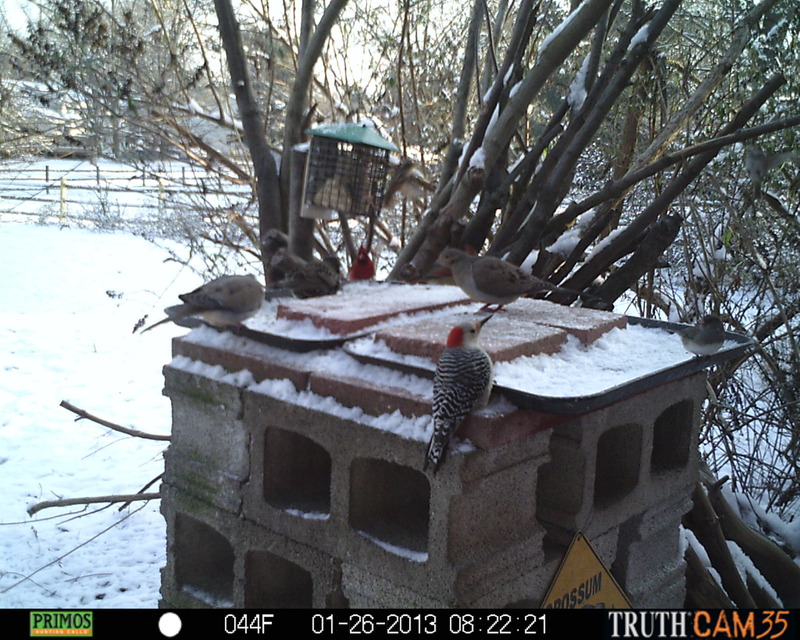 To see what goes on at the bird feeder both day and night (especially when we are asleep, and especially the animals visiting in complete darkness), we purchase Primos Truth Cam 35 Camera. In addition to relatively low cost, the vast majority of reviewers on Amazon give this camera 4 or 5 stars! (reduced 640×512 pixel thumbnail, click to see the full-size 1280×1024 pixel photo, resolution is less at night). I recommend you get the 32 GB SD card, the maximum capacity which is supported. Amazon currently sells the Transcend 32 GB Class 10 SDHC Flash Memory Card (TS32GSDHC10E) for under $25. Class 10 is defined as “high speed” at 10 MBytes/sec . How much can you store with a 32 GB SD card? Easy to operate camera without sacrificing performance. Simply load 4 D cell batteries, insert your SD card and slide the switch to photo or video and this camera is ready to go. All settings, including camera resolution, are adjustable for your specific needs and conditions. 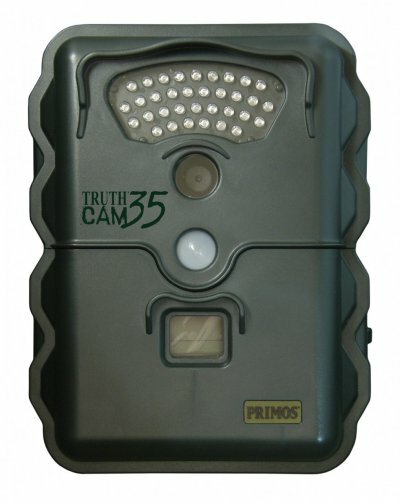 Capable of capturing both still and video images, the Truth Cam 35 offers a 40-foot nighttime range thanks to its 35 infrared LEDs. Has operational instructions printed on the camera door for convenience in the field. Trigger speed of 1.5 seconds (out of sleep mode) and takes images every 0.3 seconds when active. The camera can be set for multi-shot bursts of 1, 3, 5, 7, or 9 images per triggering. All images are stamped with date, time, temperature, and moon phase information. Back lit LED screen with large easy to read menu settings. Equipped with a molded security cable hole for theft prevention. This entry was posted in Interesting, Just for Fun!. Bookmark the permalink.